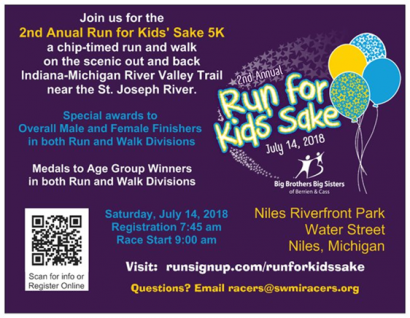 Sake event- A chip timed 5K run/walk along the scenic out and back Indiana-Michigan River Valley Trail. Race starts at 9am with registration available at 7:45am. Register early at: runsignup.com/runforkidssake and save money. Big Brothers Big Sisters provides professionally supported, one on one mentoring to children and youth facing life adversity. Mentoring works!